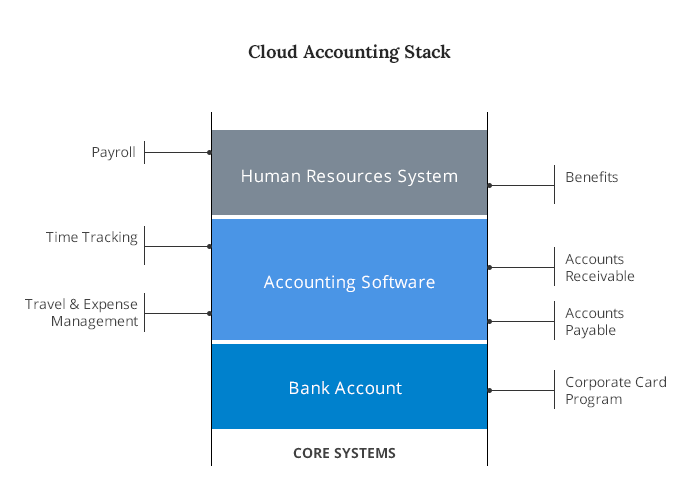 Building your cloud accounting stack is a continuous effort. Once you get the core in place, linking and adding systems comes naturally. The important part about building out any infrastructure of systems and tools is to have a good understanding of the strengths and weaknesses of each component, know what will and won’t play nice together, and what features and capabilities are non-negotiables for your business. To build a solid core that will scale with your business, you’ll want to make sure you do your due diligence, ask the tough questions, and learn everything you can along the way. The first step is to create a plan or strategy that encompasses what you think your environment will need to look like to accomplish your goals – look at the big picture. Use this plan to guide how you add on to your infrastructure, starting with the most core pieces first and working your way out. We’ve listed our recommendations on what components to include and consider in your plan for your cloud accounting stack. This is most likely going to be the base of your infrastructure. Look for a system that is a little bigger than you need, but not cost prohibitive. You don’t want to outgrow your systems within a year but you don’t want to break the bank either. Another important factor when selecting accounting software is to research what integrations are available and how they map to the rest of your plan. This is an important – payroll is tricky and not something you want to take lightly. Using a payroll service will help you ensure that taxes are collected and paid and will give you options like direct deposit for employees. Healthcare is an important benefit for employees and is a confusing road to navigate. There are numerous options and each state has different laws and requirements (much like payroll!). Using a benefits system will help you easily manage and distribute benefits while adhering to regulations. Business expenses are the second largest expenditure for most companies after payroll and need to be accurately tracked to complete your taxes. When selecting a system to track your expenses, make sure that it syncs into your accounting software. This will help eliminate a lot of man hours on data entry. Depending on your business structure, you’ll want to have the right systems in place to track money coming in and going out. If you are a subscription based software company, be sure that you can accurately set up your system to match your billing plan and that you can automatically bill your customers. This will help offset a gap in receivables. It’s also beneficial to track your accounts payable and vendor invoices so that you can quickly reconcile your books. There are other integrations to help you manage your accounts based on business needs, such as time tracking programs or e-commerce solutions. Overall, these tools should make your life easier and not be a source of dilution for your data. Be sure that they integrate well and look for good recommendations and reviews. When you create your plan for building out your cloud accounting stack, remember to think about the big picture. Get your core pieces into place and then look for additional components that will help you automate and expedite other tasks. Pro Tip: Keep a record or diagram of what systems you have in place and how they are all hooked up. This will help you scale or swap out systems as your needs change.